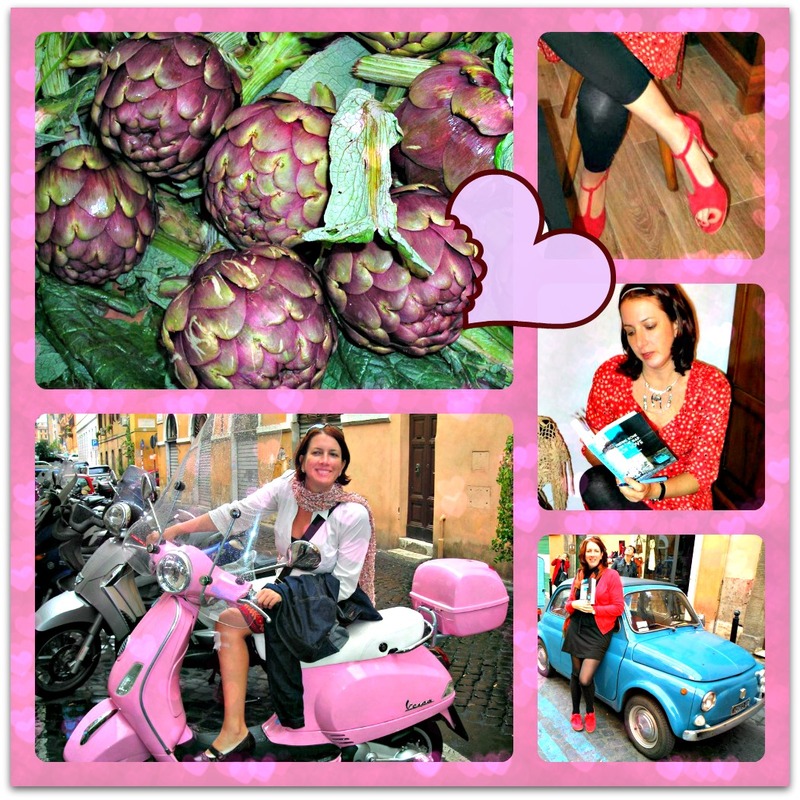 The artichoke of cross-cultural love: Italy calls! The first call to write about Italy came when I was ten. With a smudgy HB pencil, I outlined an epic in my lockable, pink diary. It was to be about an extended Italo-American family who would make it big selling tyres. The main character, Pia, was to be my age, torn (theatrically) between her Italian roots and her American life. There would be family dramas (dramatic! ), cascades of curls (curly! ), Virgin Maries (statues and exclamations), and a stout grandma overseeing boiling pots of pasta. The novel would be shot through with shouting, gesticulating, and emotional-blackmail-meets-amore. This literary project was soon shelved on the grounds of inadequate content knowledge: I knew nothing of the tyre business and had exhausted my repertoire on Italians. So the plot was filed amongst my many “books to write one day”. What I did finish writing, in my thirties, is Finding Rome on the Map of Love, in which travel narrative meets love story. It is an autobiographical account of moving to Rome with an Italian man. It is about love radiating out from the heart of my Italo-South African couple, to love for a family, language, people, culture, and country. Just like the concentric rings within an artichoke. This happens in all relationships, however it is much more pronounced when the language, culture, and people are not those you grew up with. The rings within the artichoke make it very difficult to know which characteristic belongs to whom. Is it your beloved who is prone to interrupting others mid-speech? A family trait? Or that of the whole nation? So the beloved in question — termed “the Meterosexual” for his dapper grooming — was in varied and bewitching ways the very opposite of what I grew up with. Unlike the wooden, roughly-hewn South African man, an Italian one may adore you, quite tangibly and vocally (poetically even), from head to toe. Because in his culture, your coiffure and your shoes are crucial. Core-shakingly so. The Meterosexual debated how I should do my hair for a job interview (“Hup? Down? No, hup. More professional!”) and set me straight on shoes that were an insult to an outfit. Certain footwear was actually banned from leaving the cupboard! For a woman to have her appearance critiqued by a man, even an exquisitely stylish one, demands a certain thickness of skin. But being South African, I had it. The next ring of artichoke love is that for your sweetheart’s family and culture. First I had la mamma pressing a hairdryer upon me lest I got a cervicale (the special Italian, wet-hair induced crick in the neck). And soon thereafter, I was up against what felt like an entire nation (in this case, 60 million citizens) all clucking, fussing, and advising on health, the risk of catching a cold, and what food may be consumed at specific times of day, linked to its digestibility. This counsel was dispatched entirely unsolicited, but with tenderness. Which is almost the same as love, isn’t it? Italians regarded me, being Anglo-Saxon, as afflicted with a lumpishly undiscerning cultural palate. I was urged by strangers to read Dante Alighieri, listen to Vivaldi, and, above all, focus on what went into my mouth. The Meterosexual brought home gifts of emerald olive oil, popping with vitality, and parcels of pastries wrapped in a bow, popping with calories. His mother served me the Tuscan carciofini fritti (deep-fried artichokes). And his countryfolk served me regional cuisine, ubiquitous coffees, plus the unloseable gift: an ability to discern the superiority of mozzarella di bufala (female buffalo) over mucca (cow). Further spirals of love lay in the process of gaining Italian language skills. Italian has delightful suffixes, to make words bigger, smaller, cosier, cuter, or nastier and uglier versions of themselves. This, to an English-speaker, is like playing Lego® with language. With my ability to converse came a gradual adaptation to local ways. Although, truth be told, it’s easier to learn a foreign language than, for example, to wend your way successfully through the Italian national health system or to fathom the quasi-pagan fetishizing of the modern Catholic saint. Living in Rome, I learned to ride a scooter in the city’s hair-raising traffic. This turned out to be a superbly transferable skill, relevant to many other Italian things, such as being honest. Telling the truth, the Italian way, is a flexible, savvy and self-preserving art. People lie with flair. In fact, it isn’t really lying at all, they explain. It’s being diplomatic, being furbo (smart). Banging your head against all this with rigid Protestant morals will only make your cranium ring. The Italians have taught me that blurting out the truth willy-nilly is ill-advised. It is gauche, hurts other people’s feelings, and counter-productive. Now I know: one good lie deserves another. So it is that you start off in love with a foreign person and you end up assimilating their culture. Over time, some of the once-exotic features become yours and you may even lose bits of your cultural DNA, for lack of use (e.g., wearing ugly shoes). When I find myself using an Italian gesture or expression, because nothing else will do, I know I am no longer mimicking. This is a moment of profound integration: deeper than love, more metaphysical than the first sip of the first cappuccino of the day. It will always be yours. It’s like becoming your own artichoke. Readers, I have a confession to make. I’ve always found the artichoke a bit intimidating. I’m not sure I’m any less intimidated after hearing what Estelle has to say — but thanks to her, I’m can now appreciate its succulent taste and tender heart. And I know I prefer it steamy! What about you? Are you eager to hear more about Estelle’s love adventure with an Italian, and with Italy itself? Finding Rome on the Map of Love is an utterly enchanting and fabulously funny journey outwardly, into the city of Rome, but inwardly, Estelle bravely squares up her options in love and life. Her sharp eye investigates the real and the imagined and her inimitable voice always rings true. … [W]hile the focus is Rome, it is as much about being a stranger in a foreign country and the resourcefulness that is required to learn a language, understand the customs and become familiar with the ways of any new place. When I started reading Estelle Jobson’s observations on Italian culture, I felt I had run into an old friend on a common wavelength. Yes, me too! Estelle Jobson is a very talented writer with a wonderful ear for the nuance and absurdity of language, and for the cross-culturally bizarre. … The book also boasts an extensive glossary that is bound to satisfy even the most pedantic of linguists. Estelle has an admirable career in publishing and a hectic, yet rich life. When her Italian diplomat boyfriend gets posted to Rome, she throws it all up to accompany him. There, she reinvents herself as Signora Stella, a casalinga (housewife) on the city’s highest hill, Monte Mario. Starting in autumn, she muses on life amongst the Italians and cycles through the seasons and sentiments of the Italian psyche. Signora Stella commences and ends at the same place: Follie, the local hairdresser run by Salvatore, a gay Neapolitan. This book captures a year’s worth of quirky, humorous, vivid observations about life amongst the Italians. Can’t wait to read it? Jobson has published an excerpt on Italian Intrigues, the blog kept by one of our recent Random Nomads, Patricia Winton. Extra points for likening it to a vegetable; double the points if you’re a Displaced Dispatch subscriber!!! The winner will be announced in our Displaced Dispatch on March 2, 2013. NOTE: If you’re not the lucky winner but would still like a print copy, send an e-mail to findingrome@gmail.com. Estelle Jobson has over a dozen years’ experience in book publishing and a Masters in Publishing from New York University which she attended on a Fulbright. She speaks five languages and has lived in as many countries; three years in Rome. She now lives in Geneva. To find out more about the book and follow its promotion, like the Finding Rome FB page. You can also follow Jobson on Twitter and read her occasional blog posts — for instance, this one on adopting Italian nationality, which she wrote for Novel Adventurers. STAY TUNED for tomorrow’s post, when we announce the films that have qualified for this year’s Displaced Oscars! Images: All photos supplied by Estelle Jobson. Estelle writes so accurately and amusingly about her life and love in the Italian culture. I love every word. I find myself nodding my head and laughing aloud as I read her anecdotes and stories. Having lived and loved in Italy for four decades, I know that she knows what she is talking about! Keep writing, Estelle, and I’ll keep reading–and laughing! Thanks for your enthusiasm, Lee. As I said in the book, ‘a horse needs a rider and a rider a horse’. The same goes for books and readers. A book without a reader is an inert collection of inky shapes on a page. When people like you, who have lived longer in Italy than I have, give their go-ahead, it makes me proud. Grazie. My most entertaining experiences have been to have my Italian partner serve as translator and a window on my Italian family, most of whom don’t speak English. I watch him speak so rapidly with my cousins, to whom I speak haltingly with my elementary Italian, consisting largely of nouns related to family members (seldom conjugating verbs!). It lets me see their culture in a more expansive way than I would alone–the hunting of wild boar, the collecting of wild mushrooms, the food my mother told me about from her mother (tortellini en brodo). Without him I could never have met my mom’s 80+-year-old cousin who still hunts cinghiale, or learn what makes them laugh, or hear stories of life there 100 years ago. I agree, Linda. Putting aside your mother tongue and embarking on family relations in a new language creates opportunities for improbable, surprising conversations – like the octogenarian hunting a cinghiale. Once when I was stuck in the waiting room at the local ASL (government health clinic) in Rome, I got chatting with an octogenarian who asked me if I would like to go ballroom dancing with him. Without my rudimentary Italian, that invitation would never have come to me. My pain-riddled feet forced me to decline the invitation, but it was a delightful moment. Hi Linda, the pleasure is all mine! And if and when the book’s translation into Italian comes together, your boar-hunting Italian great-aunt might like to dip into it, too. I suggest you go the official route, email https://thedisplacednation.com/author/mlawanohara/ (who is my point of contact). Let her know your full mailing address and for whom you would like the book signed (yourself, a friend, or nobody, so you can pass it along, if you wish). Looking forward to gift-wrapping your parcel! Yes, Linda, pls email me your snailmail address and any book signing request at: ml[at]thedisplacednation[dot]com. THANKS & CONGRATS!!!!!!!!! Your closing points about becoming the other really resonate with me. I’ve been in Tokyo nearly ten years and am married to a Japanese man, and though I’ll never feel Japanese, there are times when I observe myself and notice how very deeply this culture has shaped me. This is a beautifully written piece, and I’d love to read more of your work. Estelle’s book, though self-published, is of extremely high quality, informative, funny and moving; and I definitely recommend it. Publishers have missed a trick on this one, and I speak as a professional editor. Ah David, thank you for your vote of confidence. The edification of an editor can be most edifying! Actually, I find it a bit frightening to be read by an editor and fellow writer, yet I seem to know more editors and writers than any other kind of people in life. Be well. I’ve been in a bilingual, bicultural, sometimes bipolar relationship for years. From having my Novio fall asleep while carving a pumpkin to my falling asleep while watching a futbol match, it’s all about laughs for us! Love expat confessionals, so this will be on my list! Oh yes, ‘bilingual, bicultural, and sometimes bipolar’. I hadn’t thought of the bipolar angle, but it certainly is there. Yes! The rollercoaster of two differing culture’s emotional responses to life. Artichokes riding the rollercoaster. P.S. Falling asleep while carving a pumpkin? How can you leave us hanging like that? We need to know more. Why, how, what, when? I love the onion/potato analogy. I thought briefly about using the onion as the metaphor for this article, but there are too many tears and too much slicing and not enough peeling. Europeans like to see themselves as complex, deep and somewhat melancholy in the face of American robustness, simplicity and good cheer. Maybe this is the old word/new world dichotomy too.